The Pfister Hotel is a gorgeous old dame! 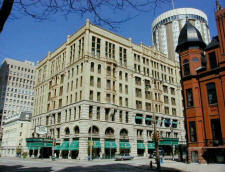 Located in the heart of downtown Milwaukee, this historic Victorian first opened its doors in 1893. It has received many awards and is considered the "Grand Hotel of the West." The lavish hotel also has several fine dining restaurants and several shops. What else could you want? Well, it wouldn’t be complete without a resident ghost, would it? It has that too. According to the reports, the founder of the hotel, Charles Pfister, still likes to visit from time to time making sure that his guests are well taken care. 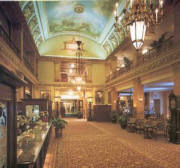 Pfister’s spirit has been seen observing the lobby (left) from the grand staircase, as well as other locations. He is always described as an older, portly, well-dressed man with a smile. Upon seeing a portrait of Charles Pfister, witnesses swear that it was the man they had seen!